WELCOME TO "FAST PC DOWNLOAD"
You will find highly compressed pc games and softwares for downloading quickly. Snow Bros Nick and Tom one of my most favorite game of childhood and i decided to share it with you all so that if you have kids disturbing you on there free time then you can allow them to play snow bros for passing good time. There are many more version of this game but i am sharing the first version of the game which is still very famous in kids. There are two characters in snow bros named as nick and tom. But you cant choose between the two character there is only one choice of Nick because the other character named as Tom is kiddnaped by the enemies. The game can be played in single and in two player modes. There are total 50 rounds of snow bros and the characters of snow bros emitts snow instead of bullets and fire. At the end of each 10 rounds you will have to face a huge enemy which is more stronger. 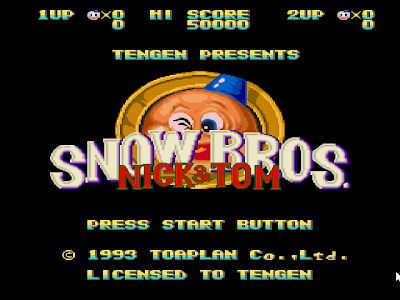 At the end of 50 rounds after defeating the final enemy Nick Retrieves the Tom and that is the happy ending of the game Snow Bros (Nick & Tom). In the game there are different powers which enhance the abilites of the Nick durning the play for example picking the red power bottle will fasten the running speed of the Nick, picking the yellow power bottle will enhance the throw of snow fire while picking the blue power bottle will make snow fire bold and picking up the green power bottle will make Nick a super man. There are special bonus chances in the game while if you can pack all the snow character then you will get bonus. The Snow Bros (Nick and Tom) is highly compressed and easy to download presented to you by Fast PC Download so keep visiting us and like us on social media for updates. 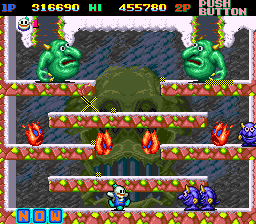 Note that this version of snow bros nick and tom can be played in full screen mode. This game seems fun and should be tried, where I get this game?